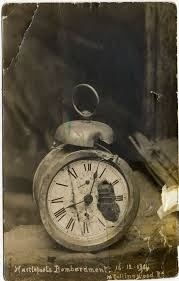 My Grandad said when he was in bed that the Second World War could have been over sooner if his alarm had gone off. My friend Ashley said his Grandad said General Patton was a shithouse, but he always got up in the morning. None of the soldiers seemed to oversleep on the day of the battle. I wonder if they said make sure you wake me up in time for the battle to their friends. I wonder if a soldier looked really tired his captain would say let him have a lie in he looks so peaceful and I really wonder most if General Patton was a shithouse and who woke him up so he could get changed ready for the battle.